Deepwater Horizon was an offshore drilling rig located in the Gulf of Mexico, about 250 miles southeast of Houston. On April 20, 2010, an uncontrollable blowout caused an explosion on the rig, killing 11 crewmen and causing the largest oil spill in U.S. waters. One of the survivors, Caleb Holloway, recently gave a powerful, moving, heart-felt exclusive interview to Dr. Diane Howard about what he experienced in the real explosion of the Deepwater Horizon, a Gulf Coast oil rig. 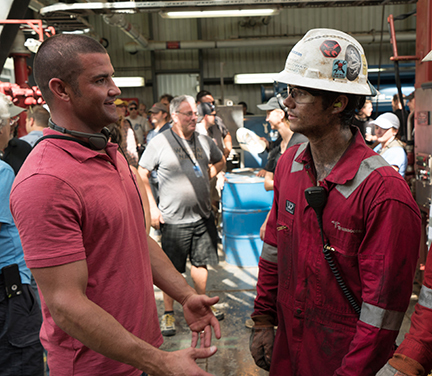 He is depicted as a key character in the movie “Deepwater Horizon,” which is currently at the top of the box office in theaters about this offshore drilling disaster. This redemptive film has real-life heroes and heroines who are role models. This movie and the stories behind the scenes have inspirational power. Caleb gave the following interview of his personal story with the Deepwater Horizon disaster to Dr. Diane Howard. DH: What was your job on the oil rig? CH: I was a floorhand, who with my co-workers, managed drilling equipment on the drill floor. DH: What were the first signs of trouble to you and your team? CH: We were in a final testing phase. Our rig drills and gets ready for another rig to bring up the oil. I worked with four hands. I had the radio. We were getting ready for the next crew and were soon to get off the tower. We received a radio message that we were to check the pop-off valve. Adam was the nicest guy and said he would do it. Adam went to the driller shack in my place and ended up losing his life. He went and said there was a problem. DH: What happened when you and your co-workers understood that you were in a crisis? CH: I was training Dan. We were cleaning the floor with the vacuum ready. I had gone down a floor to line up the vacuum to take up the mud from the rig floor. I went back up, and that was when the blowout happened from where the drill goes down. Huge equipment was blown up. The radio broke. We could not follow emergency training protocol. I grabbed Dan in the heavy drill room. I tried to get to the drill shack. There was mud first, then gas, then the explosion. I tried a phone and felt enveloped with gas, sea water, mud. DH: How did you and your co-workers respond? CH: I took Dan to the evacuation deck, but no one was there, yet. The engines starting revving, due to lack of oxygen. The lights went off. We were in total darkness. I had a flashlight. We got knocked around. I was able to get Dan into the number one life boat. At that time, I expected no survivors. I went to the main living quarters. Nothing was recognizable. Others starting coming to the evacuation deck at same time. It was nothing like emergency drills. It was chaos. Some jumped overboard. I was able to help bring out bring out three critically injured. The lifeboats were deployed. DH: Did the responses of other crew members save lives? DH: Did you sense the presence and grace of God? CH: It was by God’s grace that the water was amazingly calm that night. It was by God’s grace that the supply vessel was on hand to help. My friend fell into the water that, in some places, had burning oil on top. He broke his leg in the fall, but when I found him with my flashlight—by God’s grace—he was okay. I had in my hard hat the words to “How Great Thou Art.” I had shared the story of those words in my hat with Adam before the disaster. Those words were sung at his memorial service. DH: Have you experienced PTSD since the event? DH: Do you think the movie’s dramatization of what happened is realistic? DH: How are you doing now? CH: I still have a hard time talking about it, but I doing well, now. I am a firefighter and have been able to rescue people from burning cars and homes. I have a wonderful family with two precious boys that God gave to my wife and me at the perfect time. I am on a journey of finding meaning in what happened. I want others to know that Jesus Christ is our hope and foundation. DH: What has helped your recovery? To Holloway and the other 114 men and women who experienced the catastrophe 40 miles off the coast of Louisiana, the film is personal and a way to honor their fallen co-workers. For 87 days after the explosion, millions of barrels of oil flowed into the Gulf of Mexico, causing widespread and lasting harm to wildlife, as well as to the tourist and fishing industries from Texas to Florida. This disaster was followed by an intense government investigation, litigation and political debate. BP was found primarily responsible for the spill and has billions of dollars in penalties and settlements, as well as billions in costs for cleanup costs. Diane Howard, Ph.D. is a diologue, dialect and voice-over coach, as well as a journalist who writes about the role of faith in movies and in the entertainment field. Her website is dianehoward.com.